Rated amongst the finest beach front locations in Barbados, ‘The Lookout’ is a stunning property offering exceptional comfort and in a superb setting. ‘The Lookout’ is a fabulous penthouse, spanning two floors, (3rd floor and rooftop), with stair and lift access to the entrance of the apartment. The spacious living area and all three of the large double bedrooms open onto beachfront terraces with spectacular views out to sea and along the bay. Complete with your own private rooftop barbecue. Air conditioning and ceiling fans throughout for your comfort. Study with free internet access. Elegantly furnished. Entrance Hall and Powder room. Large comfortable living area with sliding doors fully opening onto cocktail and dining terrace. Digital television, DVD player and Bose music system. Fully equipped open-plan kitchen with laundry adjacent. High quality china, glassware and cookware. Study with desk and internet connection. Master Bedroom on the penthouse level. Terraced on three sides with fabulous views out to sea and along the beach. Emperor bed, large dressing room and en suite marble bathroom with w.c., jacuzzi bath, separate shower, twin washbasins. Bedroom 2 “Pineapple Bedroom”, Emperor bed, large marble bathroom en suite with walk in wardrobe. Jacuzzi bath, w.c., large separate shower. Opens onto terrace and balcony, views out to sea and over the freeform swimming pool. Bedroom 3 “Sunburst Bedroom”, Emperor bed, excellent marble bathroom with walkthrough wardrobe. Jacuzzi bath and large separate shower. Opens onto terrace with spectacular views down the beach and out to sea. Travertine marble floors throughout. Marble bathrooms. All fittings and furnishings are of the highest quality, with an emphasis on deep comfort. Perfect for watching the magical sunsets! 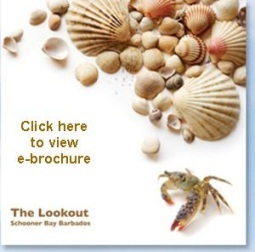 The Lookout is part of Schooner Bay, a quiet and secure gated community with a large free form fresh water swimming pool and Jacuzzi tub. Access onto the long sandy beach can be gained from the pool area. Sunbeds and parasols are plentiful around the pool and on the beach. The well stocked garden and grounds are beautifully kept, at night they are floodlit and look enchanting. There is a fully equipped gym on site and a small library. Ample parking is available.